I am keeping this issue brief as I am traveling the Pinot Trail quite a bit this time of year. I did want to get out the word on some luscious Pinot Noir I recently tasted while it is still available in the pipeline. The next issue will be devoted entirely to 2011 and 2012 Oregon Pinot Noir. Henry Siebert planted vines on the eastern side of the Russian River Valley when he was 80 years old. Ken Moholt-Siebert helped plant it and together with Melissa Moholt-Siebert they farm the Siebert Ranch, 31 acres of Pommard 4 clone. Arnulfo Becerra assisted in the initial planting and continues to tend the vines. A large, over 100-year-old ancient oak marks the center of the property, and provided the inspiration for the name of the winery which was launched in 2006. Ancient Oak Cellars produces Pinot Noir from the Siebert Vineyard and several other small, sustainably farmed family vineyards in the Russian River Valley. A second value-priced label, 47 Friends, offers a Sonoma County blend Pinot Noir. The winemaker is Kent Barthman whose winemaking background includes stints at Rutherford Hill, Taft Street, Carey Cellars, and Far Niente. Visit www.ancientoakcellars.com. 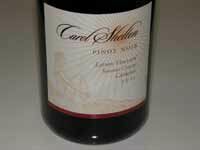 Carol Shelton is often cited as the most awarded winemaker in the United States. Her career began at the age of six when her mother developed an “identify the scent” game for her and her older siblings using household herbs and spices. It was the beginning of Carol’s path into the wine industry for she quickly became adept at figuring out new smells as the game evolved. Although she entered University of California at Davis with a penchant for poetry, she came upon her life’s calling when she first entered a wine cellar and was enthralled by the aroma of wine aging in oak barrels. Under the tutelage of Ann Noble, the author of the Aroma Wheel, she threw herself into enology studies. One of her projects on yeast strains proved that different strains produce different flavor characteristics in wine. After graduating, Carol worked with industry giants like Andre Tchelistcheff and Robert Mondavi. In 1981, she began working at Windsor Vineyards where she spent 19 years crafting 45 different wines each year. She became a fan of Zinfandel and a board member of ZAP. As the new millennium began, Carol and her husband Mitch Mackenzie, launched their own brand, Carol Shelton Wines in Santa Rosa with a focus on Zinfandel. Among her 5,000 annual case production, she draws on years of winemaking experience to include a superb Pinot Noir in her portfolio. She calls the wine a “Zin-lover’s Pinot” as it has more fruit than many Pinot Noirs. Visit www.carolshelton.com. The four estate grown Pinot Noirs reviewed here include the inaugural release of a Anderson Valley Pinot Noir from Angel Camp Vineyard. 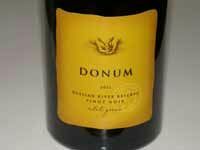 Winemaker Dan Gustafson told me that 2011 was a challenging vintage at the Donum Estate in Sonoma Carneros. Cool temperatures prevailed throughout the growing season and there was plenty of rain through June. Flowering was three weeks late and disrupted by rain, reducing crop size by 10% to 30%. Below normal temperatures continued through summer leading to extended hang time. Rains came again at September’s end, playing a minor or major role in the vintage depending on location. All lots from the Carneros Home Ranch were declassified except for two blocks, 290 (typically the base for the estate blend) and 490 (with a sub-block the source of West Slope). The 2011 Estate Grown Carneros blend is a selection of only the ten best barrels from each of the two blocks. The Carneros crus, East Slope and West Slope, were not produced in 2011. The wines are sold primarily through a mailing list. Visit the website at www.thedonumestate.com. One of the first wineries in the Napa Valley, it operated until Prohibition and was restored in 1981. The 66-acre estate Star Vineyard, planted in 1978 to Chardonnay and 1991 to Pinot Noir, is located in a unique microclimate ideal for growing Pinot Noir and Chardonnay. Each year the Pinot Noirs are outstanding, truly reflecting the unique terroir. Visit www.elmolinowinery.com. In 2006, the Caranos began a search for land that would produce superior Pinot Noir grapes. That search led them to Mendocino County, where, in 2007, they bought their first Pinot Noir vineyard in the AVA known as Mendocino Ridge. This property had been the site of a commune called The Rainbow Enterprise that was supported by growing marijuana. 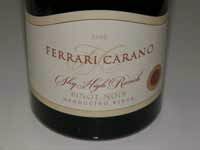 Ferrari-Carano renamed the Hayward Ranch appropriately “Sky High.” In may 2008, they bought Lazy Creek Vineyards in the Anderson Valley from Josh Chandler. Since then, they have continued to develop the surrounding 95 acres to solely Pinot Noir and have built a 10,000-square-foot winery and adjacent 760-barrel underground cave that was completed in 2011. The winery is designed for small scale Pinot Noir production. Also in 2008, they bought an existing vineyard in Anderson Valley on Middleridge mountain range known as the Ball Vineyard. This is a 160-acre ranch, of which only 30 acres are planted to Swan, Calera, Pommard, and various other heritage clones/selections. Since 2004, Ferrari-Carano has produced very small amounts of Pinot Noir from the Russian River Valley area, but failing to find readily available properties in the Russian River Valley AVA, they set their sights on Anderson Valley where they feel superior Pinot Noir is grown. The latest collection of Ferrari-Carano Pinot Noirs are impressive and reflect a serious commitment to ultra-premium quality production. Visit the website at www.ferrari-carano.com. The 2012 vintage marks the release of the first vintage from the Gloria Estate Vineyard, situated on a hillside adjacent the winery. Five clones and/or selections were chose by winemaker Akiko Freeman including Swan, Calera, Martini, Pommard 5 and 115 to be planted at this cool corner of the Russian River Valley AVA. A sister vineyard, Yu-ki, located in the Sonoma Coast, is now in full production and along with Gloria will be the focal point of Freeman’s estate wine program. The first Yu-ki Vineyard Pinot Noir will be released in 2015. Visit the newly expanded website at www.freemanwinery.com to learn more about these two properties. 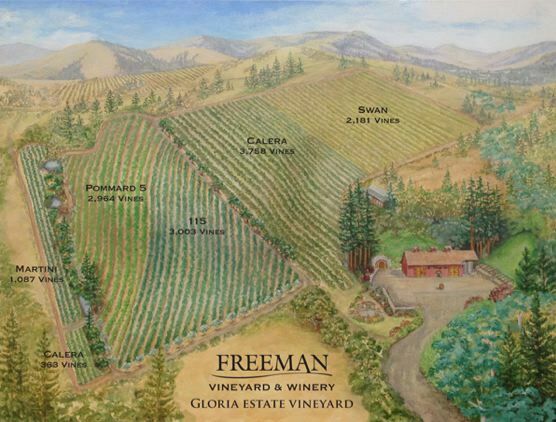 Freeman Vineyard & Winery was one of six founding members of the West Sonoma Coast Vintners (WSCV), an association of wineries and growers who farm wine grapes along the high-elevation coastline of Sonoma County. Membership in WSCV has grown rapidly as interest in the region has exploded. The organization travels to a few cities each year for a wildly popular series of seminars, tastings and dinners. In 2014, WSCV hosted its West of West (WOW) wine festivals in Chicago (April 9), Sebastopol (August 1-3) and Orange County (November 8). Like Freeman, most WSCV members are small, artisanal producers. For information about the events, visit www.westsonomacoast.com. The 2012 vintage was the first vintage since 2006 to yield an above average crop after five very small harvests in a row. Bloom occurred under perfect conditions with a large set. Summer was ideal and a perfect fall season allowed grapes to hang until late September and early October. The resulting quality was excellent in 2012. Total production remains less than 4,500 cases by design. Magnums of all wines are available. Winemaker Theresa Heredia has now been at Gary Farrell long enough to put her stamp on the wines while maintaining the traditional Gary Farrell style. She joined Gary Farrell in early 2012. She trained with renowned winemaker Craig Williams at Joseph Phelps Vineyards and brought considerable critical acclaim to the Pinot Noirs and Chardonnays of Phelps’ Freestone Vineyards. The wines have bright acidity with good structure and aromatic charm. Visit www.garyfarrellwinery.com. When the Gloria Ferrer estate was purchased in 1982, José Ferrer’s intent was to make world class sparkling wine following the méthode champenoise and the winery has succeeded in that goal. The initial viticulture team imported 12 clones of Chardonnay and 6 clones of Pinot Noir from Champagne, France. These clones had never been planted in the United States. Once it was decided which cuttings worked best for the Gloria Ferrer sparkling grapes and which for estate still varietals, the winery planted new land more suited for growing the estate varietals and named it Circle Bar Ranch. Over more than 25 years the commitment to creating estate Chardonnay and Pinot Noir runs deep. The 2011 Carneros Pinot Noir marks the 20th vintage of still wines at Gloria Ferrer. The winemaker is Steven Urberg who works with 335 acres of estate vines in Carneros. Visit www.gloriaferrer.com. A family owned artisan winery founded by Don and Jenny Hartford. The first vintage was 1994. The winery is located in Forestville in Sonoma County. Winemaker produces top notch Pinot Noir, Chardonnay and Zinfandel from cold climate regions of Green Valley, Russian River Valley, Los Carneros, Anderson Valley and the West Sonoma Coast. Jeff has been crafting Pinot Noir, Chardonnay and Old Vine Zinfandel in Sonoma County for over 25 years and has held winemaking positions at Laurier, De Loach, Mark West, Kunde, La Crema and most recently Buena Vista Carneros. Visit www.hartfordwines.com. The Heintz family has farmed this coastal ridgeline site in western Sonoma County for 100 years and Charles in the third generation farmer of Heintz Ranch. Charles credits Ted Lemon with teaching him how to grow quality fruit and the two have been working together for nearly twenty years. 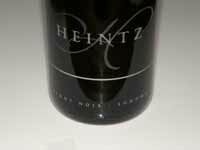 Heintz produces 100% estate Chardonnay, Pinot Noir and Syrah wines, each of then usually less than 200 cases. The wines have recently made a leap forward in quality with the hiring of veteran winemaker Hugh Chapelle who directed the production of the 2012 vintage wines. Visit www.heintzvineyards.com. Owner and winemaker Jeff Cohn, the “JC” of JC Cellars, got his start in the wine industry almost twenty years ago as an intern at Boordy Vineyards in Marland. Jeff moved to California in 1993 to follow his dream of becoming a winemaker. He earned a master’s degree in agriculture chemistry with an emphasis on enology at California State University, Fresno, in 1996. Upon graduation, he joined Rosenblum Cellars as an enologist and quickly became in charge of the entire white wine program. In 2000, he was promoted to winemaker and in 2004 became vice president of winemaking and production at Rosenblum. He was instrumental in creating cutting-edge barrel and yeast programs at the winery. He started his own label, JC Cellars, in 1996, and left Rosenblum in 2006 to focus exclusively on his own winery. His Zinfandels have garnered many awards. Located in downtown Oakland in a 15,000 square foot warehouse, production is over 5,000 cases annually. 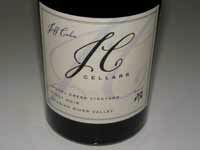 Visit www.jccellars.com. This winery was born in 2006 when two good friends created their first two barrels of Pinot Noir in a Windsor garage. Micah Joseph Wirth and Adrian Jewell Manspeaker had no chateau or wealthy relatives to name their wine after, so they combined their middle names for the new venture, respecting both their collaboration and individual contributions to the project. The partners source fruit from vineyards in Sonoma and Humboldt counties. Visit www.josephjewell.com. Justin Ennis was promoted to Winemaker at the company’s Freestone estate on the western Sonoma Coast in February 2014. He will work closely with Vice President and Director of Winemaking Damian Parker. Ennis joined Joseph Phelps in 2007 as Cellarmaster at Freestone, after a nine year stint as Cellarmaster at Williams Selyem Winery, as well as Harvest Surpervisor and Cellarmaster for wineries in New Zealand and Argentina, respectively. Visit www.josephphelps.com. The Jackson Estate collection is a new offering from Kendall-Jackson that includes wines made from favorite blocks of prized estate vineyards. The inaugural 2012 Outland Ridge Pinot Noir is from a site located at 1,500 to 1,800 feet elevation with chunky, broken rocks in thin soils on a high eastern ridge. The Winemaster is Randy Ullom. Owner and winemaker Katy Wilson is really blossomed into a top flight Pinot Noir producer of West Sonoma Coast Pinot Noir. A graduate of Cal Poly San Luis Obispo with a degree in Wine & Viticulture and Agricultural Business, she developed her winemaking skills at Testarossa, Torbreck Vintners in Australia, Joseph Phelps, Craggy Range in New Zealand and Flowers Winery where she was the assistant winemaker. Ross Cobb of Cobb Wines has also been a mentor, and Katy sources grapes from the same vineyards that Ross incorporates into his Cobb Pinot Noirs. Katy is a member of West Sonoma County Vintners and In Pursuit of Balance. The superb wines are sold through a mailing list and the winery’s website store. Her first release was 2009. 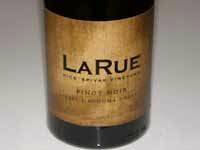 Visit www.laruewines.com. This producer in Healdsburg has taken on a new image with modernized, sophisticated labels, heavy bottles and wax closures. The wines have also taken a step forward in quality in the 2012 vintage. 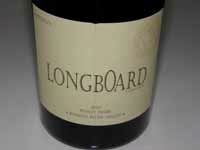 Visit www.longbardvineyards.com. 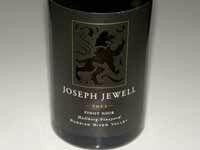 This winery was founded in 1998 by winemaker James MacPhail and the inaugural Pinot Noirs were released in 2002. James learned winemaking at Quivera, Pellegrini and Merry Edwards. The wines are handcrafted in small lots at a 5,000 case winery in Healdsburg opened in 2008. Grapes are sourced from well-regarded vineyards in various California appellations. 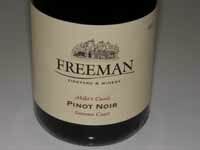 An Oregon Pinot Noir and Chardonnay was introduced in 2011. MacPhail Family Wines and Sequana Vineyards (which MacPhail founded in 2007) are part of The Hess Collection. The wines are allocated through a mailing list with some national distribution. Visit www.macphailwines.com. 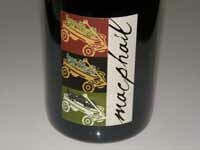 I have tasted many MacPhail Pinot Noirs over the years and have a love-hate relationship with them. James likes to lean on new oak in his wines and some wines display too much oak sheen (and therefore wine unbalance) for my personal taste. When the oak is well-integrated, the wines can be magnificent in a rich, ripe California style. All wines are 100% de-stemmed, receive about a 5-day pre-fermentation cold soak and are fermented in small open bin fermenters using native yeasts and or inoculated yeasts. Native malolactic fermentation in barrel, and stirring of the lees in barrel once every week for 3 months. The wines are aged 11 months sur lie in 33.3%-50% new and 1 and 2-year-old French oak barrels from several coopers. The wines are bottled unfined and unfiltered. Planted in 2000, Reuling Vineyard is composed of 12.2 acres of Pinot Noir (Calera and two Burgundian Vosne-Romanee clones) and 2.2 acres of Chardonnay (Montrachet selection). The vineyard is located in Forestville, Sonoma County. After selling fruit to Aubert and Peter Michael for ten years, Tim and Jackie Rueling began producing their own wines with winemaker Matt Taylor. Natural and organic farming techniques are practiced. Learn more at www.reulingvineyard.com. 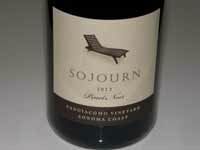 Craig Haserot and winemaker Erich Bradley started Sojourn Cellars in 2000 and released their first Pinot Noir in 2004. Their handcrafted wines have since won considerable praise from the wine press. 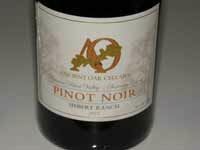 Multiple vineyard-designated Pinot Noirs are offered from primarily the Sonoma Coast AVA. The wines are sold through an allocated mailing list with limited distribution. 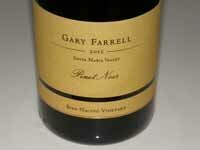 The Pinot Noirs are consistently among my favorites and they show remarkable consistency. The wines reviewed here have admirable balance and easy approachability. Sojourn has a barrel program in which consumers may own an individual barrel of luxury wine created by winemaker Erich Bradley. Once the barrel has finished aging, Sojourn will help create a private label for the bottles. Each barrel produces 288 bottles of wine. Visit www.sojourncellars.com. A family owned and operated winery in Napa Valley consisting of a 400-acre estate located in the upper Carneros region. The sites unique topography allows optimal growing conditions for numerous wine grape varieties. The winery currently produces Chardonnay, Rousanne, Pinot Noir, Syrah, Merlot, Zinfandel, Cabernet Sauvignon, Cabernet Franc, Tempranillo and Petit Verdot. The Truchards have been growing grapes in the Napa Valley since 1974 and have been making wines since 1989. The winery is housed in a one-hundred-year-old renovated barn. A small image of the barn appears on the front label of every bottle of Truchard wine. 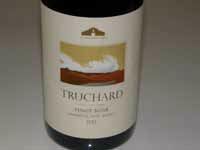 Truchard wines are all made with estate grown grapes from within a mile of the winery. Sal DeIanni is the talented winemaker. Truchard Chardonnay and Pinot Noir have been named to Wine Spectator’s Top 100 list a total of six times. Truchard Vineyards has been named Top Estate Winery of the Year by Wine & Spirits seven times. Visit www.truchardvineyards.com. This winery was founded by Bob Wait, a local to San Francisco’s Lower Haight neighborhood and owner of The Page on Divisadero Street. Bob has taken wine and grape growing courses over the years at University of California at Berkeley and Davis and is in the winemakers program at Davis. Wait Cellars is a fully bonded winery leasing equipment and space at Bluxome Street Winery in San Francisco’s SOMA district. Production is about 350 cases annually of Pinot Noir and Chardonnay. Winemaking is non interventionist with a portion of whole cluster as the vintage allows, native fermentations, elevage sur lie, a modest oak program, and no fining or filtration. The limited production is sold to wine club members and existing customers. 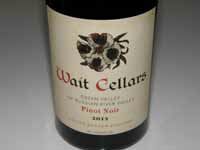 Visit www.waitcellars.com.